Wind power in the United States has expanded rapidly this decade with total installed capacity doubling between 2010 to the end of 2015 with 74,000 MW currently installed. 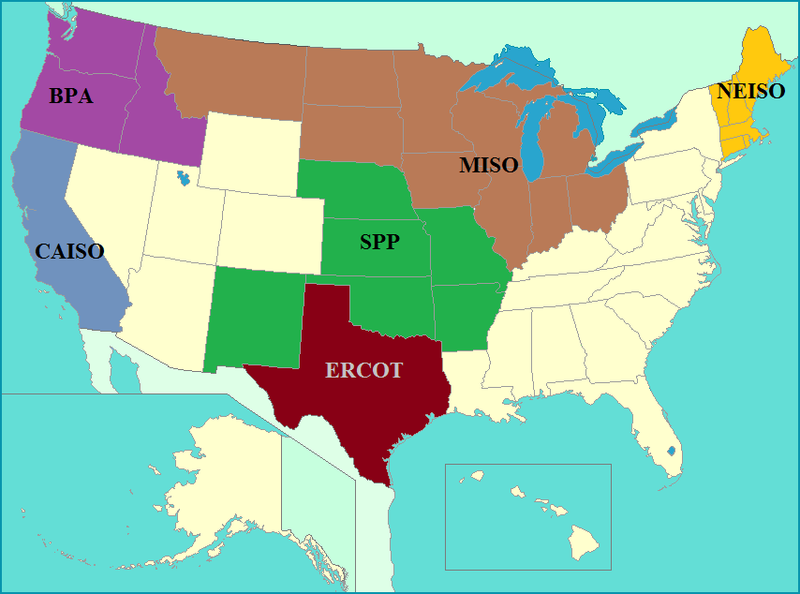 The six largest wind generating grids are California's CAISO, the Pacific Northwest's Bonneville Power Administration (BPA), Texas' ERCOT, the Southern Plains' SPP, the Midwest's MISO, and New England's NEISO. 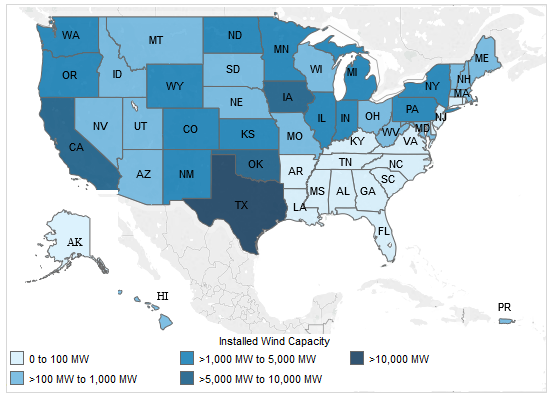 The maps below shows these regions and wind capacity by state. The six grids make up approximately 80% of domestic wind generation and these publicly available data permit a highly accurate estimate of nationwide wind generation. This data is updated on an hour-by-hour basis in the charts and maps below. Analyzing wind generation is important for natural gas investors because the rapid development of renewable energy has cut into demand for the commodity. Fluctuations in wind generations tend to displace natural gas demand since, of the major sources of energy in the United States, it is most readily ramped up or down compared to, say, nuclear, coal, or hydroelectric power sources. Depending on the day, wind generation may be equivalent to between 4 BCF and 8 BCF of natural gas demand, meaning that demand can swing up to 4 BCF/day depending on wind conditions, loosening or tightening the natural gas market regardless even if temperatures are bullish or bearish, respectively. As wind capacity continues to increase, expect heightened day-to-day natural gas demand volatility. Over the next few years, wind output may come to rival temperature as the primary driver of day-to-day natural gas demand. The table below shows maximum, minimum and average natural gas displacement over the past 60-days. Observed, current, and forecast wind speeds are calculated using a weighted average based on current installed wind capacity. For example, Texas, the state with the highest installed wind capacity in the US, is overweighted while states across the Southeast such as Mississippi, Alabama, and Georgia with minimal installed wind capacity, receive very little weighting. Current wind speed data is updated hourly as new observations are posted. Wind speed forecasts are updated twice daily at around 1 am EDT and 1 pm EDT.